TheGunBlog.ca — Bill C-71, the Canadian government’s proposed law to ban more guns and further restrict federally licensed hunters and sport shooters, won’t affect rules on borrowing and lending firearms, the Royal Canadian Mounted Police said. It will make it tougher to buy and sell them. Bill C-71 could become law as early as next month. It’s the first bill since the Firearms Act of 1995 seeking to force more restrictions onto police-vetted hunters, farmers and sport shooters who buy and use guns. The government proposed the bill in March. It’s now being reviewed by a House of Commons committee before going to the Senate. Enter your e-mail in the box below to instantly download the free 96-page PDF (2 MB). Why am I asking for your e-mail? 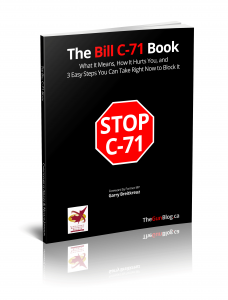 To send you any updates or other major news on Bill C-71. The RCMP said the new law won’t change Section 33 of the Firearms Act, which lets individuals lend to each other if they have RCMP-authorized gun licences. Police-approved family, friends and strangers are allowed to borrow police-approved firearms without specific approval for the loan. There’s also no time limit on the loan. “As written, Bill C-71 will not require either the borrower or the lender to obtain authorization from the Registrar of Firearms in these types of situations,” Marie Damian, a spokeswoman for the Ottawa-based RCMP, said yesterday by e-mail in response to questions from TheGunBlog.ca. The RCMP manages licensing, registering and daily monitoring of Canada’s 2.1 million lawful gun owners and their firearms. The law strictly regulates guns and labels them as “Non-restricted,” “Restricted” and “Prohibited.” Many of the world’s most-popular or iconic firearms are off limits to Canadians. If passed, Bill C-71 will change Section 23 of the Firearms Act on transferring firearms, considered as selling, bartering or giving. The bill would make it a crime for RCMP-authorized hunters and sport shooters to sell or give any “Non-restricted” rifle or shotgun without specific permission for each transaction from the federal police’s Registrar of Firearms. That’s already the case for transferring “Restricted” or “Prohibited” firearms. Transporting a borrowed “Restricted” or “Prohibited” firearm to a target range without special approval can also lead to prison.